Today is my schedule to enroll for GSIS eCard. Yup. You government employees reading this post, you know how hard it is to get in line, wait for your turn to process your papers then get a mug shot worth throwing because in the first place, you will literally look like a mugged person because of all the waiting and waiting and waiting some more. For those foreigners reading this, the Government Service Insurance System of the Republic of the Philippines is issuing identification cards to all government employees so that we, the lowly, less appreciated more often criticized government employees, can easily transact business with the GSIS like we do ATM transactions. This way, we can easily process our loans and get our dividends. [Aside] [Strophe] By the way, GSIS people reading this, I did not receive my dividend yet. Been paying religiously for years already. Why is it that most of my officemates got their dividends already even if it’s only Php200. To continue, we got their around 2pm. We forced ourselves to get in line. Enjoy the silent movie and the mellow/ballad music, forced ourselves again to stay awake, then suddenly at around 3:30pm, it was already our turn to process our papers that only took around 20 to 30 minutes max. I was pissed off. The waiting was longer than the processing. Until I saw this sign posted on one of the logitech web cameras. 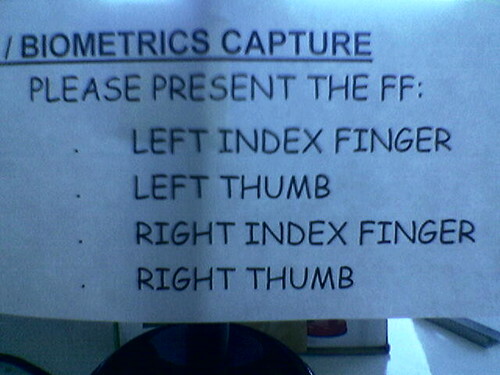 Tell me, how will you present your right thumb?